Girolamo Fracastoro (1478-1553) was a Venetian nobleman educated at Padua University. Although medicine was his true passion, he was also a poet, humanist, and scientist; and his many interests included astronomy, mathematics, physics, botany, geology, and geography. He counted Copernicus, the Renaissance mathematician and astronomer, among his friends. As a physician, Fracastoro is considered one of the founding fathers of modern medicine. He discovered that microorganisms were able to transmit infection and proposed a scientific hypothesis on tiny particles or “spores” 300 years before the empirical formulation of germ theory was developed by Louis Pasteur and Robert Koch. In 1521, he wrote several letters to his friend, Cardinal Pietro Bembo, in which he described an unknown illness as coming from the New World. A few years later, he published an epic poem about it for general audiences, Syphilis, sive morbus gallicus (Verona, 1530). The second version of the poem, published under the title, Syphilidis sive de morbo gallico (Rome, 1531), was written for physicians and describes the new illness’ pathology, symptoms, diagnosis, and therapy in great detail. The poem enjoyed enormous popularity. Through the years, it was published in about 50 Latin editions and about 60 editions in other languages. It is a fascinating example of the successful dissemination of new scientific discoveries through literature. Syphilis was not the only poem on “the French disease,” but it was considered the longest, the most serious and eloquent, and the best advertised. 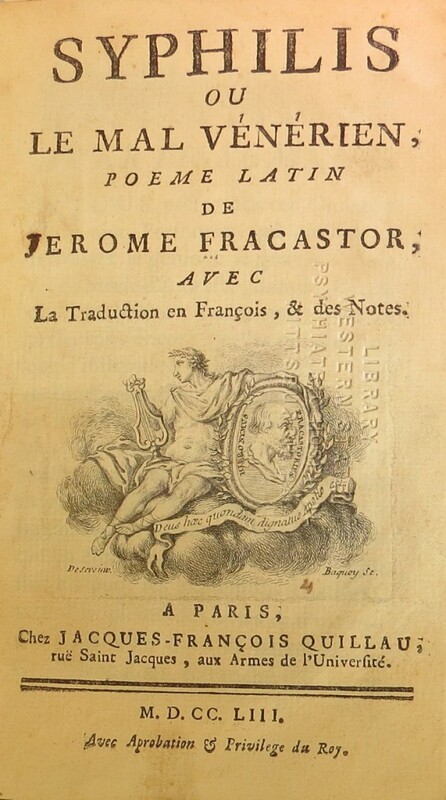 Some held Fracastoro’s work in such high regard as to put it above Virgil’s poetry. Falk Library’s copy, from 1753, includes the Latin text and parallel French translation on the opposite page. It is currently on exhibit in the Falk Library lobby display case.